By now I’m sure we all know how tea drinking got its start – or at least we know how the most popular legend about this subject goes. An ancient Chinese emperor, a kettle of boiling water, and some tea leaves that accidentally fall into it. There you have it. A tea tree claimed to be a hundred years old – just a baby in the lifetime of tea! Which probably isn’t true, to be honest. But let’s forget about that for a moment and consider the origins of the tea plant itself. While there are legends for its origin, like the one about Buddhist monk Bodhidharma’s eyelids falling to the ground and sprouting into tea plants, there’s also some actual bonafide research on the topic. Since this is not meant to be an in-depth study I’ll just focus on one example of that research for now – a 1985 paper by Minoru Hasimoto appropriately titled The Origin of the Tea Plant. Though he favors the “one place of origin” theory the author delves into the “two places of origin” theory even so. He briefly sketches out the theory and a compressed history thereof before moving on to more specifics of the “one place of origin” theory. He traces this theory as far back as 1935, when it was asserted that the difference between Chinese and Assam varieties of tea plant were not so pronounced as to suggest different places of origin. He then cites other theories for the spread of the tea plant. 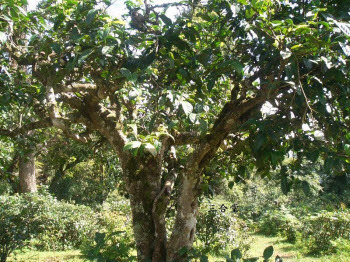 As evidence to support the place of origin he favors, he notes, “Recently, a most remarkable thing is that giant wild tea trees have been found one after another deep in the mountains and woods in the Yunnan, Sichuan and Guizhou areas” and goes on to discuss these in more detail. It’s a brief paper but one that’s worth looking at if you’re interested in this aspect of tea history. You can find a PDF version of it here. Thanks for this post. As usual, quite informative. If true, the ‘one place of origin’ may explain why Pu’erh consists of camellia sinensis assamica and not camellia sinensis sinensis. So, thanks for the link. Hard to say what’s true when going back thousands of years, but I agree that it would explain that peculiarity. And even the C. sinensis var. assamica grown in Yunnam province is not the same in flavor as that grown in Assam, India, and elsewhere (such as Kenya). Terroir enters the picture. 😉 Have a great tea day!